Julie did it first. And I filed it away for my birthday. Because I want more birthdays, for me, and you, and you, and you too. And because this year, this birthday, is my first birthday without my mother. If you're paying attention, you'll notice that it's four days after Christmas. Because I was born four days after Christmas, the vast majority of the people that I have known kind of lump Christmas and my birthday together - so yeah, I get gypped - a dearth of cards, a paucity of gifts. My mother, though, always remembered. She always set aside birthday presents, and wrapped them in non-Christmas wrapping. She knew - after all, she birthed me. I'm not asking for gifts. I'm not even soliciting for the American Cancer Society, or any of the myriad organizations out there doing good work in cancer research. But I am asking you to stop and think, think of someone you know who died too soon, who didn't get more birthdays, because of cancer or for any other reason. That's present enough for me. 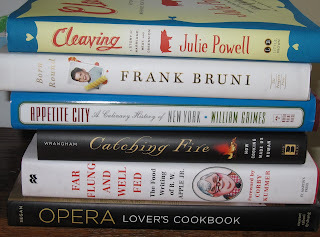 Every single book that the adults got for Christmas was food related non-fiction. I think they have us pegged. When the girl was two, we sent a picture of her in shades, holding a life-sized Elmo in a death grip. When she was three, we sent a picture of her naked on the beach, coyly looking over her shoulder. When she was four, she was in an undershirt and a crown, with a devilish expression on her face. 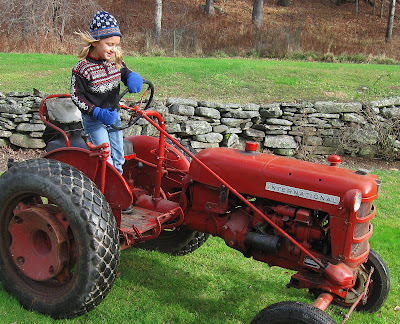 And this year - the seventh Christmas card since she was born - she's riding a tractor. We're all about the untraditional card. Happy Christmas and a Merry New Year to you and yours. Ribbon, yarn, string. Tissue, kraft paper. Cardstock. Old paper patterns. Armed with a paper cutter, scissors, whimsy and a hot glue gun, I wrapped every single present this year without buying any supplies - and they all had a thematic coherency. The wrapping was beige, brown, ecru, taupe, cream, buff, tan, and khaki - a neutral palette of saved sheets underlaying the recycled red, green, gold, silver and white ribbons. For the tags, I typed everyone's name enough times into columns in 36 point type, picked a random handful of nice display fonts, and printed out sheets of buff cardstock. A pass through the paper cutter and the hole punch, with a little piece of red crochet thread - bang zoom, tags. One set of (mailed) packages had non-standard orange and brown ribbons, only because I know that family of recipients not to care that Christmas is Red and Green. The family's set of presents was, however, internally consistent and complementary. And Santa? Santa wrapped in red/green/white/silver/gold wrapping paper, paper that we already had, or that had been carefully saved last year; the packages that will mysteriously appear overnight will be in magical colorful paper, not the buff/brown/ecru that the human parents used. Ribbons can be reused over and over. And why spend money on wrapping paper? It's just going to be torn off. It's about the giving, not the wrapping. I don't know when I learned the word upcycle - but it wasn't long ago. However, I love it - it's what I like to do! Take something with little intrinsic value and transform it into something new. A quilt made of scrap fabric, a knitted hat made of odds and ends of yarn, a wool sweater felted and remade into a bag. It's a particularly thrifty version of craftiness: there's little or no need to purchase raw materials. For years, I've been collecting pieces of scrap paper - pretty bits torn out of catalogs or magazines. The things that appeal to me have pattern, color, texture - no text, no figures, no illustrations. They're architectural details, oriental rugs, grasses, paisleys, shimmering seas. Finally, I got around to buying some Mod Podge and began transforming everyday objects. I took a handsome turquoise and blue chocolate box, covered the top and bottom with a wallpapery pattern, added some rectangles of oriental rugs, and ended up with a gift box for a handmade scarf. I covered an old stool with rough squares of leafy greens and distant landscapes, added a name in blue block letters cut from the undulating roof of a Gehry building, and produced a personalized step stool for a not-yet-walking baby (which I wrapped before I took its picture). And the little wooden box that had once held a tasty wheel of Epoisses got a new life with some (different) oriental rugs. There is the danger that I will découpage everything in sight. The child spent yesterday afternoon at her grandparents' house. While there, she helped make Christmas cookies, and brought home a little ornament that her grandmother gave her. When we got home, she asked to go down to the cellar "to wrap something". She insisted. I escorted her down to the cellar, she glommed onto some scrap red taffeta and wrapped up the ... little ornament that her grandmother had just given her. "I need a ribbon" so I found her a piece of green ribbon - "red and green, it's the Christmas colors!" - and she made a label out of paper and affixed it with enough tape to fix the space shuttle. Then she put it under the tree. I thought that was the end of things, until Friday anyway. We sat down to do her homework: fill in some blanks, do a word search, read a book (her out loud to me), read another book (me out loud to her), write a sentence about the second book*. And then she asked "Can I open a present?" At this point, the only presents under the tree are two that came by mail, one that she brought home from school, one that she wrapped using fabric and a needle & thread (and I have no idea what's in it, except that she told me it's edible, and I hope that means it isn't perishable because it's been there for days) and the two that we bought and wrapped for Daddy before the snowfall on Saturday. In other words, hardly anything, and she knows that no presents are to be opened until Christmas. Indulgent and perspicacious mama that I am, I said yes, and she proceeded to open the present from Grandma that she herself had wrapped an hour before. We said "Ooh what a beautiful ornament", and she went to bed clutching it in its box. Her excitement about Christmas this year is palpable - so much more so than ever before. It's rather magical. * "What was interesting was that the egg didn't go back in the book", in case you wanted to know. Remember the dear fruitcake? Someone from Grandparents.com contacted me not too long ago, asking for a "holiday disaster" story. In a fit of madness, and with the caveat "This may not be what you were looking for", I sent them links to the fruitcake tale and the fruitcake reveal. And they put it up on their site, but with a stock photo of an intact fruitcake, not my well-aged one. She did say "Have a wonderful holiday and try to make your keepsakes nonperishable from now on!!" Point taken. But perishable keepsakes are more the funny, don't you think? Why yes, there are wire ties and a popsicle stick holding the tree topper in place. And yeah, there's a gin label on my wine bottle, just because I'm odd that way, or maybe it's wishful thinking, because (see above) there are wire ties on my Christmas tree. I think I'm not winning any Martha Stewart awards this year. In the category of now I’ve seen everything: I got an envelope in the mail (at the office) with an "antimicrobial" lining. The girl looked at my copy of The Dread Crew and asked me "Is that about Jack Sparrow?" This morning, there was a five year old boy on the train - on his way to see the Rockettes. When we got into the tunnel, he asked his mother "is this the basement of Grand Central?" She replied "no, it's the tunnel". He then asked "is it the tunnel of love? ", to laughter all around. At least the antimicrobial envelope came from a hospital. One wouldn't want to be getting MRSA by opening mail from doctors, right? If the Con-Ed bill starts coming in antimicrobial envelopes, I'm going to start worrying. Oh, this is excellent. If you tweet about Mondays and naked Christmas trees, you get odd retweets and replies. "Hank and Patrick watched as one bright star moved across the sky." I was reading to the girl the other night, reading a charming book called What Happened to Patrick's Dinosaurs? At the end of the book, as the brothers watch the night sky, my girl interrupted me to tell me "a shooting star is not a star, it's a meteor". "How do you know that?" "From the science DVD." I'd recently gotten her a copy of the latest kid release from They Might Be Giants (thanks to a hat tip from Cool Mom Picks). It's called Here Comes Science, and if you buy the physical CD, it comes with a DVD with cunning videos of all of the songs. And you know what? It's excellent. It's got songs about blood, and songs about elements. They cover evolution and paleontology, and Roy G. Biv turns out to be the guy at the end of the rainbow. And the song that taught my daughter about meteors is a lovely little ditty that turns into a clever round. The whole shebang is a great package - fun for kids, enjoyable by parents, and slyly educational. What more could you want? Disclosure: I bought this record with my own money and no one paid me for this review. Somehow, my guest post for Ree and my Great Interview Experiment interview by TC both went live yesterday. Want to see me interviewed about various and sundry things, like blogging and free time and vacations and parenting? Visit TC at I Have Things. The usual blathering will resume tomorrow. The great and powerful Ree, a/k/a The Hotfessional, is in India, and I'm house-sitting. Please visit me at her house today, where I'm not making curry or speaking Hindi or making bad jokes about bodacious tatas. You know what really gets my goat? Okay, well, lots of things, but one of them is when someone whines that pregnancy is ten long months, OMG, because they've concluded that 40 weeks divided by four-weeks-in-a-month is ten. One year = 12 months = 52 weeks. ¼ of a year = 3 months = 13 weeks. ¾ of a year = 9 months = 39 weeks. Now, gynecologists have perpetrated the myth that pregnancy lasts 40 weeks. But that’s only because they assume that most women don’t know the date of conception, but that most do know the date of the beginning of their last menstrual period (LMP). For convenience, therefore, gynecologists start counting the pregnancy from the date of the LMP. But the date of the LMP is generally understood to be about two weeks prior to the date of conception – two weeks in which one is most definitely NOT pregnant. You aren’t pregnant until you’ve conceived. So, take the 40 weeks, subtract the two weeks in which you aren’t pregnant, and you get 38 weeks of actual pregnant time. The careful reader will note that 38 weeks is LESS than nine months. Ta da! My father lives in a little farmhouse, up in the middle of nowhere. He bought it from some people who'd gotten it from her aunt, and the aunt had been in the house for a long time. The aunt was apparently something of a character. There are still people in the valley who remember when the house was painted entirely pink, and Hazel drove a pink Cadillac to match. At some point, she changed over much of the downstairs to yellow - there was yellow cotton shag carpeting everywhere when Pop moved in - but the chandelier in the dining room is still pink glass. Outside, there are hot pink tiny roses planted along the rock wall, interspersed with wild orange day lilies - around about the Fourth of July, when they're both blooming, you could be blinded by the vibrating pink and orange. Hazel was the kind of modern woman who didn't use her husband's last name - and had a career to boot, as a painter of some skill. Once upon a time, the story goes, her husband was in the hospital, after a heart attack or some such. Hazel arrived for a visit, and gave her name to the nurse. The nurse escorted her into the room, and announced her: "Mr. Carter, your girlfriend's here." Mr. Carter sighed "Millicent" and Hazel turned on her heel and left. When he finally got out of the hospital, and arrived home, he went upstairs to use the bathroom. Imagine his surprise when he discovered a naked woman in his bathtub. He asked Hazel about her; she snipped "That's Millicent". Neighbors ask if she's still in the bathtub. If visitors haven't been to the house before, they're escorted up to see the lady in the tub and the hand painted hollyhocks on the bathroom walls. Children are particularly titillated. I've never actually taken a bath in the tub; the paint is a little flaky and we've not researched the proper conservation technique for bathtubs painted in a fit of pique. Luckily, there's a shower elsewhere in the house. The nice thing about having an independent six year old is that you can dress her up in snow pants and send her out into the backyard for hours with no supervision on a Sunday morning after the nice first snowfall of the year and she comes back hollering "Mommy, I made you a snow duck" and carries said duck into the kitchen, wet boots and all. The other day, BlogHer threw a party in NYC. It turned out that that same day was also "It's Time to Talk about Domestic Violence" Day. I learned about this from someone I met at that holiday party. Today, in an effort to clean house and do the right thing, I googled to find out how to get rid of some old cellphones that were kicking around. 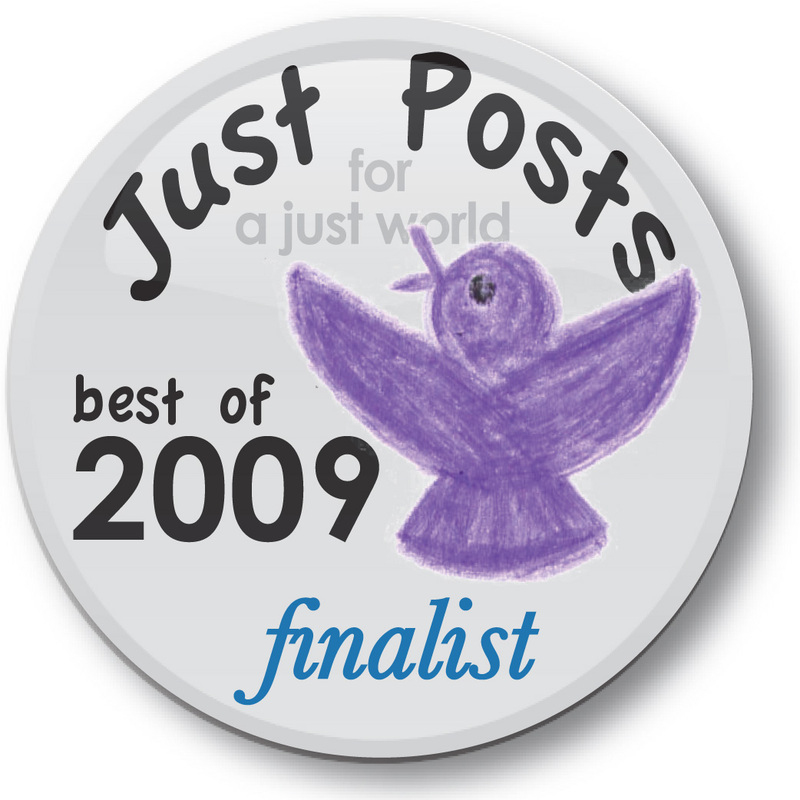 In a flash of synchronicity, one of the first sites I found was for the National Coalition Against Domestic Violence. Bang zoom - the phones were in a postage paid box waiting for my mailman - to be either refurbished for use, or recycled. Out of the landfill, and repurposed for good. I was taught at an early age that one should never ever write in books, or dog-ear their pages. In college, I wrote in books of necessity, especially for English classes. But after I stopped reading for a grade, I stopped writing in books again. A Stew or a Story is a mish mosh of short pieces that Fisher did for various magazines. It was compiled a couple of years ago, not by her, some fifteen years after her death. As such, it’s of uneven quality, not like the uniformly sparkling and acerbic work released during her lifetime. I was finding it quite a slog for a while - as you can see, the first note I made was about page 203. But matzoh, spread with butter and spices, and warmed through in the oven? That sounds divine. So does the “Railroad”, a picnic dish of her devising – in which one removes all of the insides of a loaf of French bread, leaving nothing but crust, spreads the crust with butter, layers it with ham, wraps it in a dishcloth, and invites a guest to sit on it 15 minutes before serving. A pressed sandwich! Tomato soup proves to be her comfort food, when served just so in a particular little jug, with a dash of cinnamon. She waxes rhapsodic about local eating, a locavore well before the term was coined. She buys a sugar shaker for her father, at an antique shop in London – I read her description of the “top with a dainty finial…star-shaped holes…unscrewed neatly for refilling” and wondered in recognition – I’ve seen sugar shakers and not known that that’s what they were. The moment that sold me on the book, though, was when I came across a 1986 New York Times Magazine piece called “In Nice, Snacking in the Flower Market”. Somewhere in my house, I am quite sure that I have that very piece ripped out of that very issue of the magazine. I know I ripped it out; I think I still have it; I know I never tried to make socca. It’s a sign. I will now try to find some chickpea flour. MFK Fisher wants me to. And I think she’d approve of my small cryptic notes on the end papers of her book. Dancing on the Lincoln Center fountain, in the rain, on Thanksgiving Eve. Maybe you've heard this. Chase Bank is giving $5,000,000 away via Facebook . Sounds great, right? All you have to do is vote for your favorite charity, and tell everyone you know. Actually, in the first round, you can vote for 20 favorites, so you can horse trade with your friends. It's crowdsourcing philanthropy! A new model for the new social media! Charity by the people! But the problem is that it’s a popularity contest that rewards those organizations with the greatest social networking savvy and not those with the greatest impact and/or efficiency of operations. Arguably, a small organization with terrific grassroots skills but mediocre delivery of a dubious service could win a million bucks - and then fritter it away on pizza and airplane tickets. There's no vetting, no due diligence. Forgive me for being a deeply cranky cynic, but this whole thing just looks like Chase spending $5,000,000 to make itself look good by tossing some spending money at a handful of charities. Sure, the top vote receiver will get a cool million, but 106 organizations out of 500,000 will split $4 million (the last million will be doled out by ”a special Advisory Board led by prominent national philanthropists...to the nominated charities of its choice"). Keep in mind here that Chase got $25 BILLION in bailout money last fall - $5 million is chump change. This isn’t philanthropy, it’s marketing. And what’s more? They’re making the 300 million Facebook users do all the work.